3-match ban for Costa? Karma, you can do better than that. Seriously, Karma. That’s all you’ve got? I’ve had more time to think about it, to view videos, to digest the FA decision that was passed down today. I find myself unsatisfied by their decision to vacate the Gabriel red card and to charge Costa with a three-match ban. It’s simply not enough punishment for what went down. Diego Costa elbows/swipes Koscielny in the face, three times; none of four officials sees it. Diego Costa chests Koscielny to the ground; it was completely visible in live action to everyone in the stadium and watching on TV, but none of four officials sees it. Diego Costa hits Gabriel in the chest and scratches his neck visibly. Referee maybe sees it. Gabriel hits Diego Costa in the chest. Referee sees this one for sure. Diego Costa hits Gabriel in the chest. Referee sees it. Referee gives one yellow card to Costa and one to Gabriel. Costa and Gabriel walk back to the middle of the field, talking smack in Portuguese. Referee does nothing to stop or separate them. While Gabriel is backing up, Costa stops behind him. During and after all of this, there is bad behavior by several other players on both teams including pushing, yelling, surrounding the referee. Gabriel is particularly incensed after the red card and engages in all of the above before leaving the field. Arsenal play a man down for the entire second half and, later, two men down for the last 10+ minutes when Santi Cazorla is rightfully dismissed for two yellow card infractions (a one-match ban). He left the field quickly, but had a brief word with the 4th official on his way off. Much later, Costa kicks Alex Oxlade-Chamberlain; none of four officials sees it. Costa is removed from the field by Mourinho for one of two reasons: 1) he’s obviously going to keep trying until he gets a red card himself or 2) to receive a giant ovation from the Chelsea supporters for his fine work on the field (which they deliver). Despite that he did not produce much of value on the field as a player of the game of football, but did produce the reduced number of opponent players that Mourinho required to win, Mourinho declares him man of the match. After the match, the FA (English football’s governing body) produced a number of charges against the teams and players, paraphrased below. Arsenal also asked for FA review of the Gabriel red card. Today, it was announced by the FA that the Gabriel red card would be vacated because film review showed he did not land the kick on Diego Costa; however, he still must answer to the charges regarding failure to leave the field upon receiving the red card. It was also announced today by the FA that Diego Costa would receive a three-match ban for the action on Koscielny. Santi and Gabriel have until Thursday to respond to the additional charges. Now, let us evaluate the respective punishments. Gabriel would have had a three-game suspension for a minor kick, barely a nudge (even if it happened). But he was also required to leave the field at halftime and could not be replaced, forcing Arsenal to play a man down for more than 45 minutes. These conditions naturally favored Chelsea. Although certainly not unheard of, it’s rare for a side to win when they’re a man down. Ultimately, Chelsea produced a goal and took all three points; when Arsenal were down another player, Chelsea produced a second goal. Diego Costa committed a red-card offence with the first action I described. For that he belatedly got punishment similar to a straight red card–a three-game suspension–except Chelsea were not required to play a man down for the entire second half as they should have been. (And remember, if the referee had taken the right action on the field, all of this would have happened without Gabriel committing the infraction that got him sent off. Arsenal would have been a man up for a half.) Then Costa committed multiple other offences, a veritable crime spree, including simulation to get an opposing player sent off. Multiple Chelsea players sold it, the crime that never occurred. And a poor refereeing team bought it. Considering all of this and his many prior offences, the FA has failed to even come close to a proper punishment for Diego Costa. The FA is worse than the referees because they had all the time in the world to look at all the evidence. Like the referees, they know his prior record. But like the referees they apply the rules inconsistently. The travesty will be complete if Gabriel or Cazorla receive a minute of suspension for their supposed additional crimes. Costa wasn’t punished for the many crimes he committed after the first offense; why should either of them? Arsenal were handed a huge disadvantage because of poor refereeing and Costa’s cheating. There shouldn’t be a single other punishment added on if there is any fairness in the system. 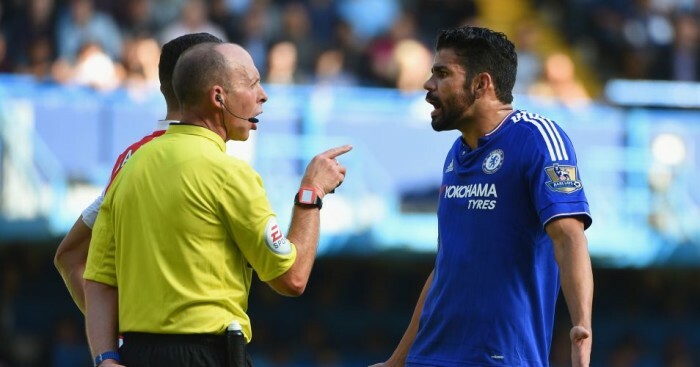 With a three-match suspension, the FA let Costa off the hook. Karma, don’t embarrass yourself on Costa the way the FA did. There’s a job to be done.